Gemmological Instruments deals with the developments in diamond grading equipment and gem testing instruments since the publication of the first edition in 1978. These developments include improvements in the versatility and styling of existing instruments such as the reflectivity meter, the composite spectroscope, and the refractometer. It also addresses the criticisms in the first edition and provides a discussion of the advantages and disadvantages of different gem testing equipment. 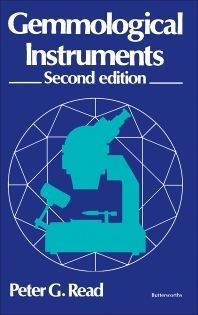 This book is organized into 16 chapters that describe groundbreaking instruments like the thermal conductivity diamond testers and home-constructed items that while innovative have not yet been commercialized. There are also chapters dealing with microphotography and identification of synthetics and stimulants. This book also provides a listing of gemstone constants and characteristic inclusions in natural and synthetic gemstones. This book will be of interest to people interested in equipment for gem testing and diamond grading. Appearance (Including Colour, Transparency, Surface and Internal Features, Etc). Refractive Index. Birefringence. Pleochroism. Dispersion. Specific Gravity. Absorption and Emission Spectra. Luminescence. Hardness. Cleaning Methods. Ultrasonic Baths. Tweezers and Scoops. Stone Papers. Hand Lenses. Head Loupes. Microscopes and Attachments. Microphotography. Inspection Lamps. Selective Absorption. Allochromatic and Idiochromatic Minerals. Dichroscopes. Colour Filters. Colour Grading. Colour Measuring Instruments. Refractive Index by Immersion and Microscope Methods. Critical Angle Refractometers. Polariscopes and Konoscopes. The Table Spectrometer. Relationship Between Refractive Index, Lustre and Relative Reflectivity. Relative Reflectivity Meters. Hydrostatic Weighing Method. Heavy Liquid Method. Specific Gravity Indicators. Specific Gravity Bottle. Absorption and Emission Spectra. The Prism Spectroscope. The Diffraction Grating Spectroscope. The Reversion Spectroscope. Use of The Spectroscope. Fluorescence and Phosphorescence. Cathodoluminescence. Triboluminescence. Crossed Filters. LW and SW Ultra-Violet Lamps. X-Ray Equipment. Directional Hardness. Mohs Scale. Hardness Pencils. Hardness Test Plates. Thermal Conductivity of Diamond and Other Gem Materials. Thermal Conductivity Diamond Testers. Synthetics-Alexandrite, Corundrum, Emerald, Opal, Spinel, Turquoise, Lapis Lazuli, Quartz, Diamond. Simulants-Alexandrite, Diamond, Lapis Lazuli, Paste. Composite Stones. Artificially Coloured Diamonds. Air-Boundary Refractometer. Brewster-Angle Refractometers. 'Direct Method' R.I. Vernier Gauge. LED Refractometer Light Source. Phosphoroscope. Computer-Aided Gem Identification. Equipment for the Automatic Sorting and Sizing of Rough Gem Diamonds. The Grading of Polished Diamonds. Grading Equipment. Grading Standards. The Weighing and Weight Estimation of Diamonds. The Identification of Polished Diamonds. The Electron-Spin Resonance Spectrometer. X-Ray Topography. The Electron Microprobe. The 'Luminoscope'. The Wide-Band Spectrophotometer. The Scanning Electron Microscope. Future Applications of Research Techniques. Gem Test Equipment. Portable Gem Laboratories. Video Microscopy. Jewelery Photography. Anti-Static Products and Devices. Anti-Vibration Pads and Mounts. Optical Filters. Materials. Catalogues.